Please tell me how to prune different types of fruit trees? Mark, Atascadero. Apricot: these trees have an upright and vigorous growth habit. Apricots produce fruit on short-lived spurs. It is best to cut back all the previous year's growth by ½ or more which will encourage new growth and new spurs. Apricots (and Cherries) should not be pruned in wet weather. Six weeks of dry weather assures that they don't get infected with Eutypa, a form of wood canker. It's safest to wait until summer to prune for the following year's fruit set. Prune apricots annually. Apple: a tree with a spreading habit. Most of the fruit develops on spurs 2 years old and older. The productive life of spurs is about 5 years. Therefore, don't remove spurs. Do, however, remove all dead wood and branches which rub together. Thin out branches to let in sun light and remove water shoots. Prune annually and when dormant. Pear: trees can be upright or spreading, depending on varietal. Fruit matures on spurs 2 years or older. The productive life of spurs is 10 years or more! 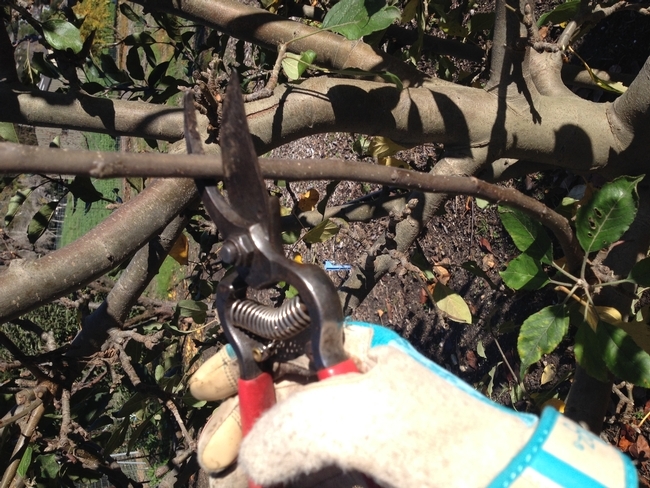 Prune lightly only removing dead wood or rubbing branches. Prune annually when the tree is dormant. Peach and Nectarine: trees have an upright and spreading growth habit. Fruit is borne on the previous year's growth. This means new fruiting wood must be produced every year in order to have good fruit production. Heavy, annual pruning is recommended. Pruning a minimum of ½ of last year's growth, mostly done by heading, is a must. Prune when dormant. Plum: European plum is upright; the Japanese plum is variable and can be spreading. Fruit is born on spurs 2 years old and older Spurs are productive 6-8 years. Prune lightly, thin and remove dead wood. Prune annually and when dormant. Don't forget to use tools that are sharp and clean. It is advised to disinfect all pruning tools between each tree. A solution of one part rubbing alcohol to one part water is a sufficient disinfecting dip for the blade or saw end of your tools. For further information the UC ANR Publications website offers books such as Home Orchard: Growing Your Own Deciduous Fruit and Nut Trees. Enter promo code PRLUS40 to receive 10% off your purchase.